The drone-based mechanism overcomes a critical bottleneck in the application of Sterile Insect Technique (SIT) to control insect pests, said the UN International Atomic Energy Agency (IAEA), which developed the system in partnership with the UN Food and Agriculture Organization (FAO) and the non-profit group WeRobotics. “The use of drones is a breakthrough, and paves the way for large-scale and cost-efficient releases, also over densely populated areas,” said Jeremy Bouyer, medical entomologist at the Joint FAO/IAEA Division of Nuclear Techniques in Food and Agriculture. SIT, a form of insect birth control, uses radiation to sterilize male mosquitos, which are then released to mate with wild females. As these do not produce any offspring, the insect population declines over time. However, to be effective, the technique requires the uniform release of large numbers of insects in good condition over a given area. For instance, Aedes mosquitos, responsible for the spread of diseases like dengue and yellow fever, do not disperse for more than 100 meters in their lifetime. They are also fragile, and high-altitude releases by airplanes – often used in the application of SIT for other insects – can damage their wings and legs. The drone-based system overcomes this problem. “We’re pleased with initial tests that show less than 10 per cent mortality through the entire chilling, transport and aerial release process,” said Adam Klaptocz, co-founder of WeRobotics. The breakthrough technology also cuts the cost of the process by half. Until now, sterile mosquitos have been released using time-consuming and labour-intensive ground methods. “With the drone, we can treat 20 hectares in five minutes,” said Mr. Bouyer. Weighing less than 10 kilograms, the drone can carry 50,000 sterile mosquitos per flight and at 10,000 Euro per drone, its use also reduces the cost of releasing mosquitos by half. 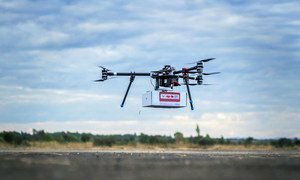 The IAEA and its partners are now working to reduce the drone’s weight and to increase its capacity to carry up to 150,000 mosquitos per flight. The system test was carried out last month in Brazil, a country hit hard by the 2015-16 Zika epidemic, which also spread to other parts of South and North America and affected several islands in the Pacific, and South-east Asia. Brazil plans to start using the drone-based system in select urban and rural areas from January 2019, at the peak of the summer and mosquito season. “We are hopeful about the application of SIT for the control of Aedes aegypti in Brazil with the results from the drone tests,” said Jair Virginio, Director of Brazil-based Moscamed, a recently-designated IAEA Collaborating Centre.